Owen D. Magie (known by his middle name, Douglas) was born in 1921 in Arkansas. He lived with his mother Pearl, his father Orion, and his two sisters, Nadine and Mary Lee. In 1930 the family had moved from Arkansas to Blue Township in Jackson County, Missouri, where Orion worked as a carpenter at an oil company. Owen would have only been ten years old during this first move. The family rented a house on 39 Farley Street. Owen attended grammar school as a child. The 1940 federal census shows the family living in another rented house, 111 South Willow Street. Owen graduated from Northeast High in Kansas City, Missouri. At some point, he moved to Los Angeles, California, where he worked as a machinist. Owen was drafted and reported for duty on August 18, 1942. His enlistment file notes that he was single, with no dependents. When Owen D. Magie died, his next of kin was his father, who would receive the devastating news of his son’s passing. More than 450,000 Missouri residents served in the military during World War II. More than 8,000 Missourians died in the conflict. At home, residents organized air raid drills and participated in rationing and scrap drives. Missourians also purchased more than $3 billion in war bonds during the eight drives conducted for the war. Local groups and well-known figures supported the war effort as well. The war brought a surge of prosperity to Missouri agriculture, and farming became a major war industry in the state. Manufacturing in Missouri also benefited from the war; both St. Louis and Kansas City were home to major war industries, particularly aviation in St. Louis. Kansas City was a hub of aircraft manufacturing and development. Due to the large influx of people to California in the 1930s and early 1940s, California became more urbanized. They saw the growth of industrial production and military installations. California contributed to the war machine by supplying troops, crops, and money for soldiers and their families. They also had camps for people not in the war but looking for jobs. These camps were made so that unions could fill the labor shortage from all the soldiers being enlisted in the war. This solved the labor shortages and also gave paying jobs to people in need. However this caused a problem for some soldiers who came back looking for jobs but found that they were all already filled. Magie reported for duty on August 18, 1942 and volunteered to join the 506th Parachute Infantry Regiment. 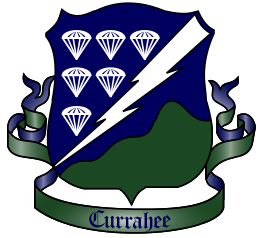 The 506th Parachute Infantry Regiment did their basic training in Camp Toccoa, Georgia adjacent to the Currahee mountains. The regiment made “Currahee” their motto. In November 1942 they moved to to Fort Benning for parachute training. There the unit learned to pack their own chutes and how to properly prepare their equipment in order to drop in an airborne operation. After advanced airborne training at Fort Benning, the unit moved to Camp Mackall, North Carolina. It was here that extensive tactical training was conducted, including night jumps. 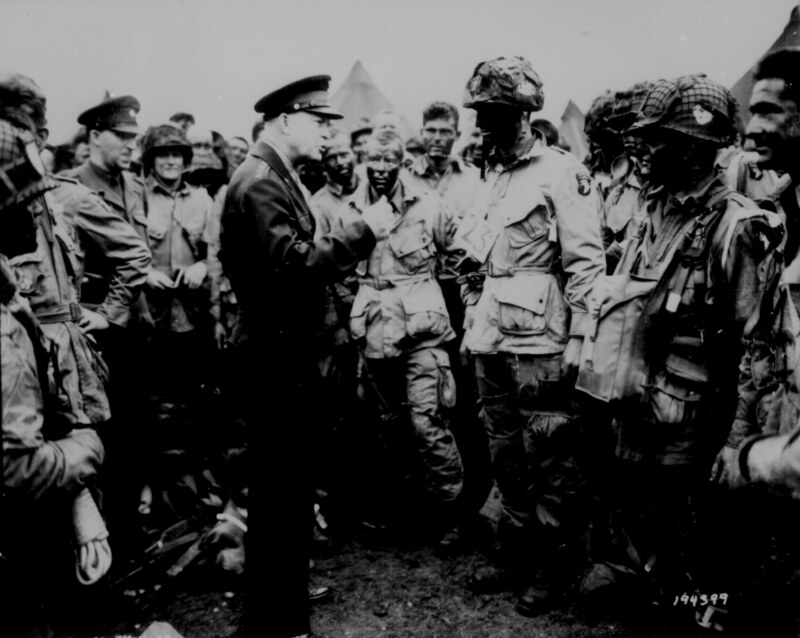 The 506th Parachute Infantry Regiment took their first active combat jump on June 6, 1944, at 1:00 a.m. on D-Day in low cloud cover with anti-aircraft fire splitting up the troop carrier formations. Only the 3rd Battalion landed in close proximity to their drop zone because of German anti-aircraft fire. Some paratroopers landed as far as 20 miles from their zones. The Germans also managed to kill the battalion commander, Lieutenant Colonel Robert Wolverton early in the attack. Magie participated in the Normandy Invasion, struggling through hedgerows and avoiding enemy fire. On June 13, there was heavy fighting near the French town of Carentan. Members of 506th Parachute Infantry Regiment were ordered to secure the southwest approach to the city. On June 13, the 506th Parachute Infantry Regiment was ordered to attack enemy forces to increase the defensive perimeter around the city. It is likely that Magie was killed in this action. On June 13, D-Day plus 7, Private First Class Owen D. Magie’s life came to an end. Sadly, he never saw how his efforts helped to ensure freedom. He was awarded the Purple Heart and Bronze Star for his actions. Owen Magie was born in 1921 in Arkansas. Owen entered the military on August 18, 1942, and served as a paratrooper in the 101st Airborne Division, 506th Parachute Infantry Regiment. Owen died on June 13, 1944, while fighting on foreign soil. Not many people today or even people of his time period knew how vigourous and dangerous it was to be a paratrooper. Paratroopers had a wide variety of training aside from other soldier training that was based specifically on their job, according to their rank. I visualize Magie being shipped off to a far away place to do training. Owen had to learn how to pack his own parachute, how to jump out of a moving airplane, and land on a small target. Not mention that most of these jumps were conducted at night to practice for real battlefield conditions. It took guts to be paratrooper. I do not know if I could do it, but one thing I do know is that Magie was very brave and strong-minded to be able to do what he did for our country. Paratroopers were literally dropped behind enemy lines into enemy territory to to gain the military advantage on some of the most difficult missions. I can only imagine what went through Magie’s mind when they were left stranded with no backup. He just had to pray that he and his fellow soldiers could break through and meet up with reinforcements. These men were brave souls that did what most people hope that they never have to do. Owen Magie, thank you for your service and for the bravery that you demonstrated while fighting for our country. Though Owen Magie and I never met, I learned a lot about him and his life while doing this research project. I found a lot of great information that gave me a pretty clear picture of how he lived before as well as after the war. Its very difficult to believe but we were very close in age when he went into war and for me to think of that is mind boggling. Being able to do this project and learn about him, and his unit, has been very rewarding and has given me a new perspective on the freedom I have now, as a teen, in the twenty-first century. Before this project I did not understand how useful and important a resource like Ancestry.com is in the retelling of a forgotten hero. This website gave me very credible information in order to understand what Owen went through and helped me to learn the personal cost of war. This war was won by thousands of courageous individuals, some of which never made it home. This project completely changed my outlook on war by showing me all that goes into it and it made me conceptualize all the hardships that each soldier had to overcome. I have learned to respect the servicemembers and their families even more. I have learned that without the brave young men that took a stand for what they believed in, we would not have many of the things we cherish today. The project taught me that every victory, any ounce of positive change, comes from one individual committing to taking a stand and become part of a movement bigger than themselves. This is what sacrifice is. This is what Owen Magie did, along with the millions of other brave individuals who came before me, did. 506th Parachute Infantry Regiment insignia. Wikimedia Commons. Accessed October 5, 2017. https://commons.wikimedia.org/wiki/File:Distinctive_unit_insignia_of_the...(United_States).svg. Missouri. Jackson County. 1930 U.S. Federal Census. Digital Images. http://ancestry.com. Missouri. Jackson County. 1940 U.S. Federal Census. Digital Images. http://ancestry.com. Northeast High School Yearbook. 1938. Digital Images. http://ancestry.com. Owen D. Magie. Headstone and Interment Records for U.S. Military Cemeteries on Foreign Soil, 1942-1949. Digital Images. http://ancestry.com. 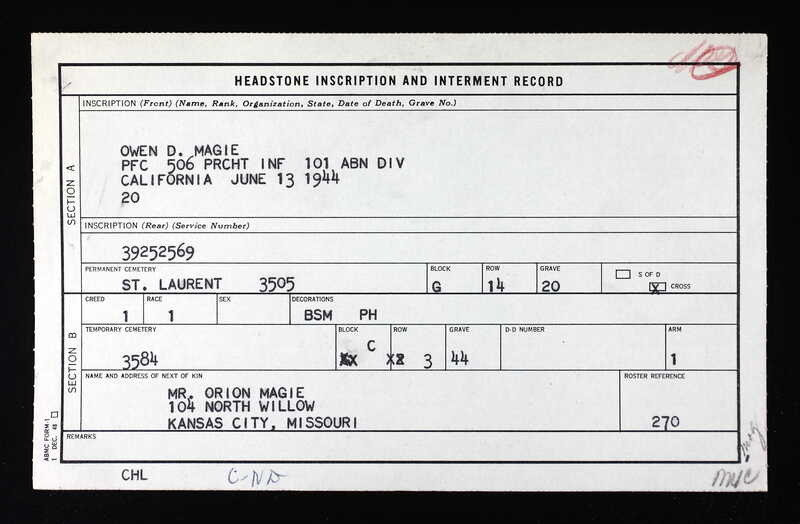 Owen D. Magie; World War II Army Enlistment Records, 1938-1946 [Electronic File], Record Group 64; National Archives and Records Administration [retrieved from the Access to Archival Databases at https://aad.archives.gov/aad/, October 5, 2017]. “506th Parachute Infantry Regiment Unit History.” 101st Airborne Division, World War II. Accessed May 24, 2017. http://www.ww2-airborne.us/units/506/506.html. “Owen D. Magie.” American Battle Monuments Commission. Accessed October 5, 2017. https://abmc.gov/node/411179#.WdaR8mhSzIU. Utah Beach to Cherbourg. Washington, D.C.: U.S. Army Center for Military History, 1990. https://history.army.mil/books/wwii/utah/utah.htm.